Tony Chris presents his Christmas children and family magic show for schools and corporate events that has made him one of the most in-demand children's entertainers in all of Canada. In this DVD, he will perform 3 separate shows in front of live audiences in the school system and from his corporate Christmas show. You will see a real world professional children's magical entertainer performing his signature Christmas effects that have been a part of his act for over 20 years. Tony transforms into his children's character persona of Zany Zack and will perform 17 of his magic Christmas tricks. Then he explains how to make and customize them for a Christmas theme. Included on the DVD is a bonus section with 5 other Christmas effects including his amazing Wilting Poinsettia routine which is worth the price of the DVD alone! He will also give you some very valuable marketing tips that have worked for him and keep him booked solid in the month of December. 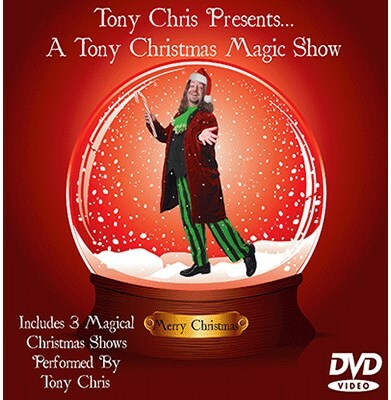 If you ever wanted to see a real world professional children's magician perform his fantastic Christmas themed magic show, then this DVD is for you! This is the most comprehensive and entertaining children's magical Christmas DVD you will ever see. It is nearly 3 hours long and full of fantastic, fun and practical Christmas magic!